Well time flies, and it's time for our monthly check on Hilary Hobgoblin. He's been quite heroic this week, rescuing a load of piskies that would otherwise be sold into slavery. He still hasn't found the kids he's looking for though! Do go keep track of him at Brevenynews! - He's also been replying to quite a few messages lately. The Victoria Art Gallery in Bath appears to have gone a bit dragon mad this summer, and it lasts until October! "The worlds of literature, film and art, both past and present, demonstrate the enduring popularity of the dragon as magical creature, fearsome fire-breather, insomniac guardian of treasures, and scaly flying serpent. A creature to be loved and loathed, perhaps, but never cuddled, stroked or offended! 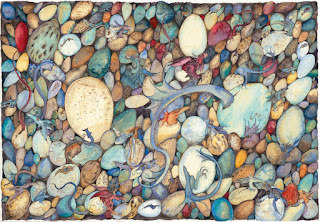 Our family oriented summer show sets out to mine this rich seam of dragon lore through images created by some of the world's best children’s illustrators and writers, from Chris Riddell (Ottoline and Goth Girl) and Axel Scheffler (The Gruffalo) to Quentin Blake and Cressida Cowell (How to Train Your Dragon)." It looks really good, and there are some photos of the kind of art in the exhibition below, but it's not all about the art, it's also about the adventure! Around Bath City Centre there are eight hidden dragon eggs, which you find using a special app, which contains a compass, pointing to the right egg. 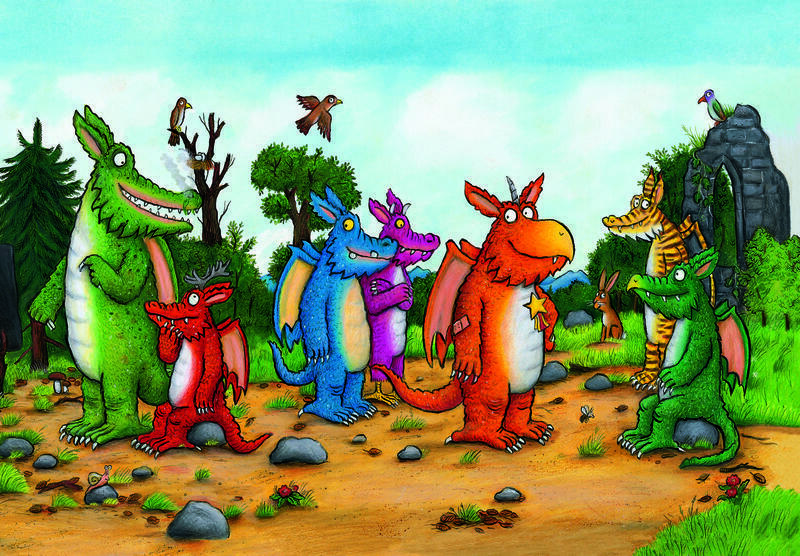 Find the eggs (each in the style of a different children's illustrators) and collect the dragons in your app. And there are even fabulous prizes! There is a gold letter on each egg. If you put these letters in the right order then they spell out a word. Figure out the word and you get a bookmark, but also go into the prize draw to win a goody bag with signed books, toys, games, tickets and other goodies! Now I know you're all sick of the Amazon reviews, so here's my first review on Waterstones! "I have read this book multiple times and I never tire of the witty humour and fun nature of this book! I would recommend it to everyone. A beautifully created land and amazing creatures! I thoroughly enjoy reading this book and hope to see more! 5 stars!" I'm glad people are still liking the book. Do please keep the reviews coming! 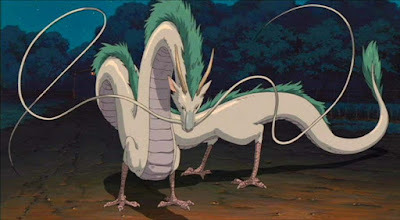 This is Haku, from the beautifully animated "Spirited Away". Even saying that much is a major spoiler, so I won't say anything else apart from you NEED to see this film. Buy it now! It's cheap on Amazon! It's another item of fan art from Beth! Look at this cute little creature! It's a Vampire Sprite, a pesky little creature that hides in the dark and tries to drain you of your blood. Isn't he a sweetheart?! I'm quite impressed by this one because I don't really describe them in the book (the only times they appear in book one is when it's very dark). But I reckon this is pretty darn close. It's cute. It has humanish characteristics (arms and legs) as well as batlike wings. 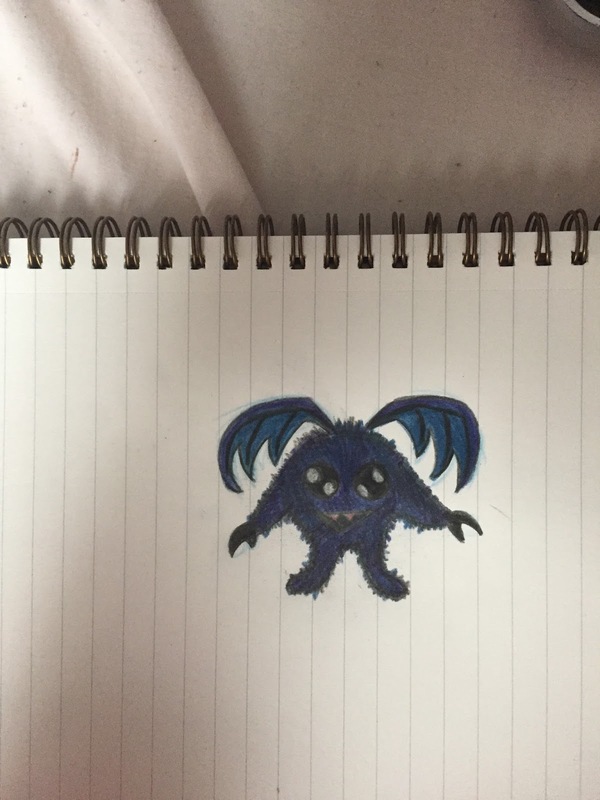 It has fangs for sucking blood and huge eyes which would explain why they shy away from light. I asked Beth why she decided on making him furry. She said that mainly it was because I'd described the creatures as "Batlike", but that also she wanted to pay homage to the "Soot Sprites" from "Spirited Away". 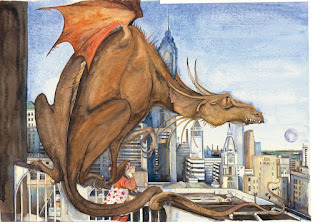 I really should do a "Spirited Away" blog post at some point as the dragon in that is gorgeous! I mentioned in last week's blog post that I'd like to revisit how exactly Aaron got expelled. Well here it is! Portia Banks, headteacher at Saint Cuthbert’s Academy, tried to ignore the sound of the beginner violin lessons in the room next door, and instead focussed on the array of musical instruments that Martyn Malone, music teacher, had displayed on the desks. On the middle desk was a tuba, the end of which had a dent in it the size of a small dinner plate. “Does it still play?” Portia asked, tentatively. Portia looked at the clarinets. She wasn’t a musical expert but she was sure that the bits of metal hanging off the instruments were not meant to be at that angle. “I’m afraid so. I had the lid open, because, well, it looks cooler, but it meant when the tuba hit the piano strings, things broke.” Martyn gestured to the piano and Portia looked inside. There were a number of snapped strings and significant scratches in the woodwork. The piano lid was cracked, Portia guessed it had slammed shut when the tuba hit. A noise like a strangled cat came from the lessons next door. 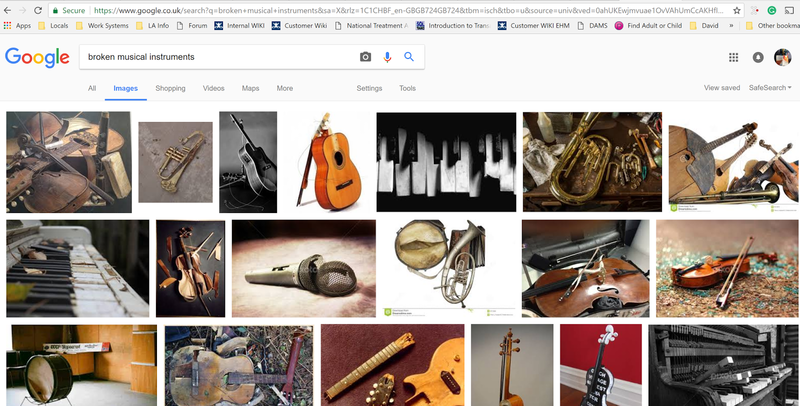 Why couldn’t Aaron have smashed the violins? Just then, there was a knock at the music room door. Julia Price, a year seven student, was at the door. A few weeks ago I drew your attention to an appeal by a charity Article 39, who want to stop children being deliberately hurt by escorts when they're being taken from or to secure children's homes. They were trying to raise £8000. Well... Here's how much they raised! A wonderful total. Helped in part by the NSPCC, who pledged £1000, TACT who also pledged £1000 and the Fairer Fostering Partnership who pledged £500 Hopefully this will be more than enough to bring this vital case to court. I still have some more amazing Amazon reviews to post, and my mum hasn't even written hers yet, even though she promised to aaages ago! Anyway.... This is a nice review from Mrs Sharon Kirkley. "Loved this book. A great read. Lots of adventure and fantasy characters. Looking forward to the next one." Thanks, Mrs Kirkley. I'm looking forward to the next one too! So what do we actually know about Aaron from Aaron Gray and the Dragon War? "He looked like a normal eleven year old, with blond hair, green eyes and freckles"
Aaron is eleven years old at the start of the story and he's in year 7 (the first year of secondary school). He's already been kicked out of one school for playing with Bunsen burners (among other things, I might release the incident report at some point). He's old enough to get the bus on his own. He's a "Looked After Child"
"Aaron was officially looked after by his local council. He had no idea where his mum was and his dad lived on the other side of town. His social worker, Mrs Seeger, visited him every few weeks." Aaron lives in the Autumn Grove Care Home, a residential children's home for children who have struggled in foster care placements. In the story (at least in book one) we don't know where Aaron's mother is, but we learn more about Aaron's dad and the circumstances that meant Aaron had to become looked after by the council. We only get to see it from Aaron's point of view though, and he was quite young at the time. ""It does have to be perfect," Aaron moaned. “I’ve been dreaming about the same cruddy dragon for my whole cruddy life, and I can’t even get his cruddy head right.”"
"He hummed to himself to fill the awkward silence, humming music that he usually heard in his sleep." A dragon flew through the ceiling, roaring at an invisible enemy. Whenever Aaron had the dragon dream there was always the same music. It hung around after he woke up, echoing around his brain like the music at the end of a film. When he hummed the same tune he could see the dragons as if they were right in front of him." Even Aaron finds this a bit weird. So he does everything he can to make the dreams go away, which brings us to another important thing to know about Aaron. “They took me back to the shop to apologise. But I’d just drank all those energy drinks. 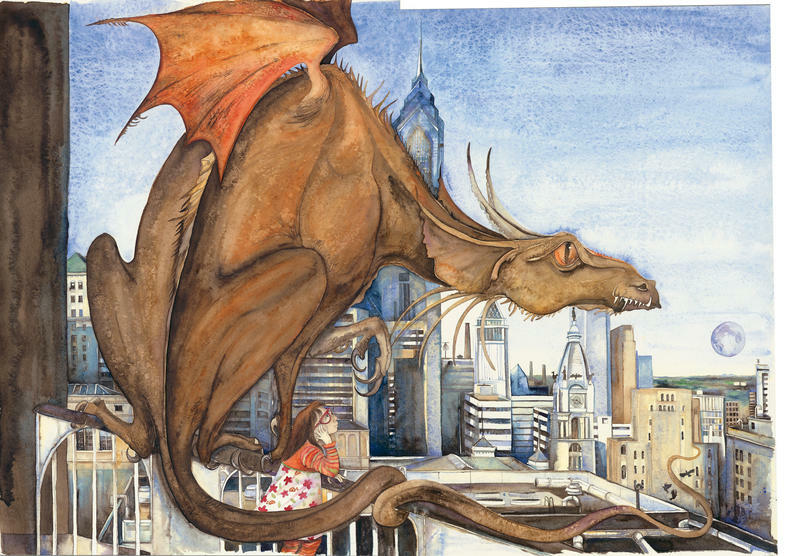 I started rambling about dragons and I was sick over the newspapers.”"
Throughout the story, Aaron has no respect for authority, probably because people in authority have let him down so many times in his life. He's happy to break the rules if he thinks it will help him. ...But he does care about his friends. "Aaron sighed as the truth dawned on him. He didn't belong in Celebration Village. He belonged with his friends." Aaron clearly cares deeply about his friends and would do anything to protect them. His lowest point in the story is the time he fails to do exactly that. Back in January I had fun writing a blog post on the City of London Dragons. 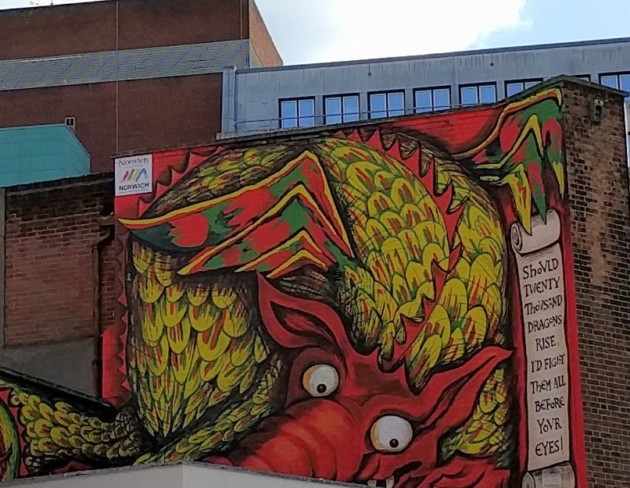 Basically I went to London, saw a dragon, and dug as far as I could to see what it was doing there. It was great fun, so in March I did the same thing with The Welsh Dragon, which now contains one of my all-time favourite dragon stories. Well for the last few months my work has been taking me to the wonderful Norwich, which contains this beauty. Isn't it beautiful! It's a mural at the top of a building and it would be easy to miss if you're not paying attention. I've since learned that the best view is from the third storey window of Debenhams! 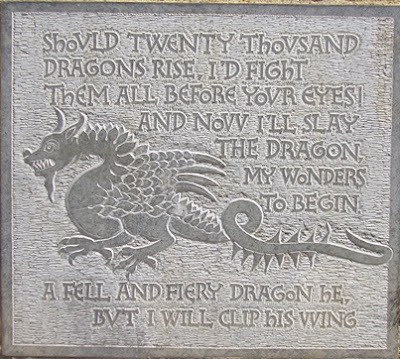 So what do we know about this dragon, and the quote on the side - "Should twenty thousand dragons rise, I'd fight them all before your eyes."? 1) It's allowed to be there. This isn't just someone graffitiing a wall (well obviously, it's too spectacular). This work of art was commissioned by Norwich BID and was created by Malca Schotten, a local artist (do check out her website for more beautiful things). So this dragon is inspired by another dragon, which also has a history. Are we really going to go down the rabbit hole and investigate that dragon? Of course we are! I already knew Norwich was my kind of place (their geeky TV and movie shop is amazing! ), but it turns out they even have a lot of dragons in their history. This is the castle's Snap, a 300 year old dragon puppet. Why did they have a dragon puppet? Well that's a whole other story. So let's dig even deeper and find out! 4) Norwich used to have a "Guild of St George"
The guild of St George was founded in 1385 and was basically a Christian charity offering help to the poor and needy. 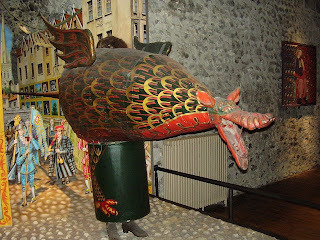 Every St George's day they would have a procession around the city, and we know at some point in its history this procession developed to include some kind of battle between St George and a dragon. The guild wasn't that important and the procession not particularly notable, until King Henry V gave them a royal charter. After that they were really important and the processions, complete with dragon, became huge. With great power comes great responsibility (I'm sure I've read that somewhere) and a lot of people weren't happy with the guild's influence on the city. Eventually the guild managed to make a deal with the local council. They became partners, and the big procession was no longer just about St George's day, but also became part of the town's mayor making ceremony. 6) And then the dragon defeats St George! Hoorah! Bye bye George (and Margaret whoever you are!) The dragon wins. 7) And then the dragon becomes the people's champion! Time passes and by 1835 there's no longer a mayor and no longer a guild. Norwich is poor and there's no need for a ceremony or a snapdragon. This could be the end of the story, but no! The local poor people make up their own fake guilds, with their own fake mayor, their own ceremonies and even (yep you've guessed it), their own snapdragons! Snap the dragon lives on! Well as the artist said, it was also found in the castle grounds. I was thrilled when my friend told me that they'd bought a copy of “Aaron Gray and the Dragon War” to give as a present to your school. I really hope you like it. I wonder who you’ll like the most. My favourite character is Arboris the dragon. Lots of people like Aaron the best, but he’s really naughty and rude to grown-ups. Julia’s nice though, she’s clever and good at martial arts. There are a few bits in the book that are quite scary, so if you don’t like adventures where people you like might get hurt, then you might want to choose a different book to read. If there was a chart of scary books, then this book would be described as scarier than “Harry Potter and the Prisoner of Azkaban”, but not as scary as “Harry Potter and the Goblet of Fire”. Don’t worry, though, the dragons are nice! What's the social service system in Breveny like? I always wonder about bureaucratic systems in fantasy worlds. Especially with Aaron being in the care system. Like you get a lot of prejudices about children in the system here, what would the preconceptions of people in Breveny be like? Do different species manage their own bureaucratic systems or are they all organised by the dragons. Are there like, foster homes with a huge variety of humans and fantastic creatures or are they kept separate? There's no big, formal, social care system in Breveny. If there were, then, on arrival, Alec would have immediately contacted the authorities and the two kids would have been placed in an emergency foster placement. Jack, meanwhile would have been picked up by the Missing Children's team and placed in a secure unit until he was assessed not to be at risk of running away again. Cecil would have been arrested under child labour laws for attempting to send the children on a quest, and the story would have been very different. Breveny is the kind of place where stuff gets done. A whole village is at risk from warring dragons, so the whole village moves underground. Everybody works together and takes care of each other. In its extreme you can see this at Calmat, where everyone is given jobs to do under the leadership of one person. However even without this leadership you can see similar community in action, like when Mel invites the children to stay with her, saying with confidence that she could find other families in the village to look after them more permanently. We are getting into book two territory here, so I'll be careful. The dragons are in charge. Other creatures "pay them tribute" which usually means giving them food and gifts and doing what they're told. There are ways that the dragons earn their tributes but I'm not giving anything away. It's unlikely that a dragon would intervene to the extent of say, finding a family for an orphan child, as the communities will usually handle these themselves. Well let's not pretend they all live together in harmony. Even in book one, things are tense. Each type of creature has their own traditions and cultures and they will proudly keep those traditions. Generally each creature will look after their own kind, which is why places like Calmat are so unusual and interesting. But the dragons are definitely in charge. There's no hierarchy within the other creatures apart from the dragons. For example the humans aren't any more or less important than the keythongs. Everyone is technically equal, even if everyone thinks mud-elves are gross and that piskies are stupid!